In partnership with Piki Films and coinciding with the first anniversary of the film's release in New Zealand, we're delighted to present this majestical poster for 'Hunt for the Wilderpeople'. 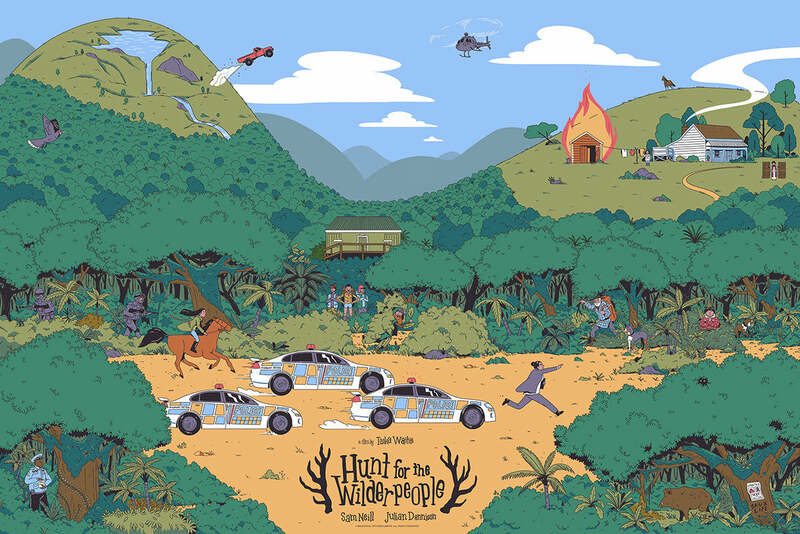 In this large format limited edition screen print, UK illustrator George Bletsis has created a super fun piece that draws you in as it beckons you to quite literally hunt for the wilderpeople. "I love this poster. It reminds me of the kind of thing I would make as a kid, obsessing over every detail I remembered from movies I loved. I'm particularly pleased to see the minister is in there too!" - Taika Waititi. And for the more creative among you, we're also releasing a smaller keyline poster so that you may unleash your inner colourist. These are printed on the same heavy duty paper stock as the main edition so you can frame it up and display on your walls whatever medium you use. We can't wait to see your creations! 'Hunt for the Wilderpeople' is now on sale here.